(1) So anyway on a particular site I had a guy who didn't believe in global warming. I linked him to the NASA website which essentially proves GW and he responded with THIS, im hoping someone who is more knowledgeable can address and/or debunk his points. Really appreciate it. That's actually not true. CO2 levels are not higher than they have ever been, they are only higher than they have been in the past 650,000 years. CO2 levels were far higher millions of years ago, so why isn't NASA showing all of the data? They must know that 650,000 years is essentially an instant in our planet's 7 billion year history. The only way something like titanaboa, dinosaurs, and other large critters could have existed was for temperatures to be far higher then than they are now. These climate scientists pulled the exact same stuff in the 1970's, but back then they were saying humans were causing global cooling and that there would be a new ice age. Again, computer models are not evidence, and even the IPCC concedes that it's models were overestimating the rate of warming. It's interesting that you say people who don't agree with you won't accept any view but their own; sounds to me like you need to look in a mirror. Not that it's any of your business, but I was raised by die hard democrat parents. The last few sentences of your comment are very telling. They show that you're emotionally driven and believe that you believe the issue of climate change is a partisan issue. Now, a few opposing pieces of evidence. Mars polar ice caps were smaller during the period of warming on Earth in the 1990's. They started growing larger again 17 years ago, directly coinciding with the pause in the rise of global surface temperatures that even climate scientists are admitting is completely factual. CO2 levels on Earth wouldn't effect Mars, would they? In addition, there seems to be a problem with global warming proponents in understanding that correlation does not imply causation. Sure, there is a correlation between a rise in CO2 levels and a rise in surface temperatures. That doesn't necessarily mean that CO2 is causing warming. It's just as likely that warming is causing more CO2 to precipitate out of the oceans. This seems to be backed up by the paleo record which shows that CO2 actually lags behind temperature. (1285) Sounds like this guy knows a lot more than you do about the subject. (4) The sun not man is the driver of all climate---the orbit of the earth around the sun causes the earth to receive more or less radiation. which causes more or less heating or cooling. Man is the recipient of the cooling or warming not the cause. (3) Kenneth, that's only partially true. Yes, the sun is by and large the biggest driver of climate change due to cycles in insolation, but there are smaller oscillations caused by internal conditions within Earth's climate system. One of those happens to be greenhouse gases. Normally, an increase in solar radiation causes an increase of greenhouse gases, thus increasing the warming effect. This is called a positive climate feedback. In the case of anthropogenic climate change, it has been proven that humans have been responsible for increasing greenhouse gases without the effect of solar radiation. No matter how insolation changes, an increase of greenhouse gases will cause an increase in global temperatures. I'm sorry, but humans are having a profound effect on Earth's climate, the extent of which is not yet fully understood. (4) Man's activity only produces about 1% of the carbon-dioxide that is produced each year----and most of the free carbon-dioxide is fixed by biological activity as it is produced. The small amount of increase of the carbon-dioxide is reduced by increased biological activity. The carbon foot print myth is a ploy by liberals to extract a tax penalty from untutored persons. However the green house gasses that do most of the warming of the climate are water vapor and methane---Man use of natural gas causes a reduction in the free methane as it is used for fuel---most of the fossil fuel methane will escape if it is not used as a fuel. The small amount of carbon-dioxide that is produced by burning fossil methane is then fixed by biological activity. The greatest climate changing activity is caused by the changing orbit of the earth around the sun. In 50,000 years the earth will begin a dramatic cooling as the new ice age will be in full effect for another 25,000 years----then we will begin another warming trend climaxing in a warming period like the one now in progress. (3) I have not verified that that 1% figure is accurate, but assuming it is, that can still make a huge difference. The Earth has a certain assimilative capacity to handle pollutants like CO2. If you exceed that amount at all, you wind up with a surplus that stays in the atmosphere. The strongest orbital cycle occurs at roughly 23,000 years. The last glacial maximum occured around 21,000 years ago. This puts the Earth today at a spot near the trough of this orbital cycle. If orbital cycles are the only driver of climate change, it is likely the Northern Hemisphere would be entering an ice age today. However, we are not. We are warming due to factors within Earth's climate system. It is important to consider that even changes on a decadal or millennial scale are caused by something. That is what we are experiencing now: a rapid warming on too small a time-scale to be caused solely by orbital changes. And while I agree with you that the climate change issue has been manipulated and politically abused, there is real science behind it. It is an issue both the uninformed public and political class have decided to take up in arms about and attempt to defame hardworking scientists in their field. (2) The greatest climate changing activity is caused by the changing orbit of the earth around the sun. (3) I think the individual who replied to you, sounds like he does know what he talking about but then again, Global Warming does not exist it was made up by " die hard democrats" to have something put out there, and also some sciences do not believe in global warming. It's still question if global warming does not exist and it is a global issue today, says the government, but if you want to believe it does not that is perfectly fine. I don't believe it is exist frankly, all we do is just pollute the air a little and Our God will do the rest. (1673) A little googling will show that your correspondent is simply making it up as he/she goes along. To take an obvious example, the generally accepted age of the Earth is 4.54 billion years, not 7 billion. Also CO2 levels have shot up over the last 200 years or so and are now are higher than they were in the Pliocene epoch, 5.3 to 2.6 million years ago. when the Earth was much warmer than today and the sea level was about 30m higher. The stuff about Martian ice caps reflecting temperatures on Earth is nonsense, and CO2 concentration lags temperature in the paleo record because the circumstances were different then (no SUVs!). You've got to wonder what the motivation is for people to put out this denial crap. Are they paid to do so, or are they just useful idiots? (256) Surface detail is absolutely correct. Your respondent and most of the comments in this thread so far are sourced, I am sorry to say, in ignorance. CO2 levels are, per the Vostok ice cores and several other sources, higher than they have been in at least 800,000 years. The RATE at which CO2 has increased since the beginning of the Industrial Revolution - a crucial parameter - is higher than at any point since the KT Boundary Event, the Chicxulub Impact, 65 million years ago. All this material about what CO2 did millions of years ago is irrelevant (as Surface Detail pointed out) because there were no humans at all. Modern human culture and its infrastructure, which is what global warming threatens, has only existed for the last few hundred years. Modern culture and Anthropogenic Global Warming (AGW) have roughly the same birthday. so why isn't NASA showing all of the data? They must know that 650,000 years is essentially an instant in our planet's 7 billion year history. The only way something like titanaboa, dinosaurs, and other large critters could have existed was for temperatures to be far higher then than they are now. Data going back to the formation of the planet is available. NASA is not hiding anything as your denier friend would like to imply. The 650,000 year scale originated with the first Vostok cores and was the extent of accurate atmospheric data at the time such graphs were made. These climate scientists pulled the exact same stuff in the 1970's, but back then they were saying humans were causing global cooling and that there would be a new ice age. No, they did not. That an ice age was imminent was never a widespread assertion among the nascent climatologists of the 70s. There were a few papers suggesting such a possibility and they had some basis. Look at any global temperature graph of the 20th century and note what happened between 1941 and 1979. But even then, if asked, the majority opinion held that human CO2 emissions had the potential to warm the planet. James Hansen's 1981 paper still looks good today. Again, computer models are not evidence, and even the IPCC concedes that it's models were overestimating the rate of warming. I've just come from a different discussion forum where I've been participating in climate debates like this for a great while. The duplication of the same set of unsubstantiated (and nearly universally false) assertions is almost astounding. I'm sure, however, they would simply say they argue the same truth. The results of model runs are most assuredly evidence. Don't let anyone tell you otherwise. Like any piece of evidence, their value varies. But they are the ONLY way to make projections so arguing that they are valueless and should not be used is simply to say that we should close our eyes and walk away from the problem. "We should take life one day at a time". "We need to accept whatever life and the good lord give us". Really? 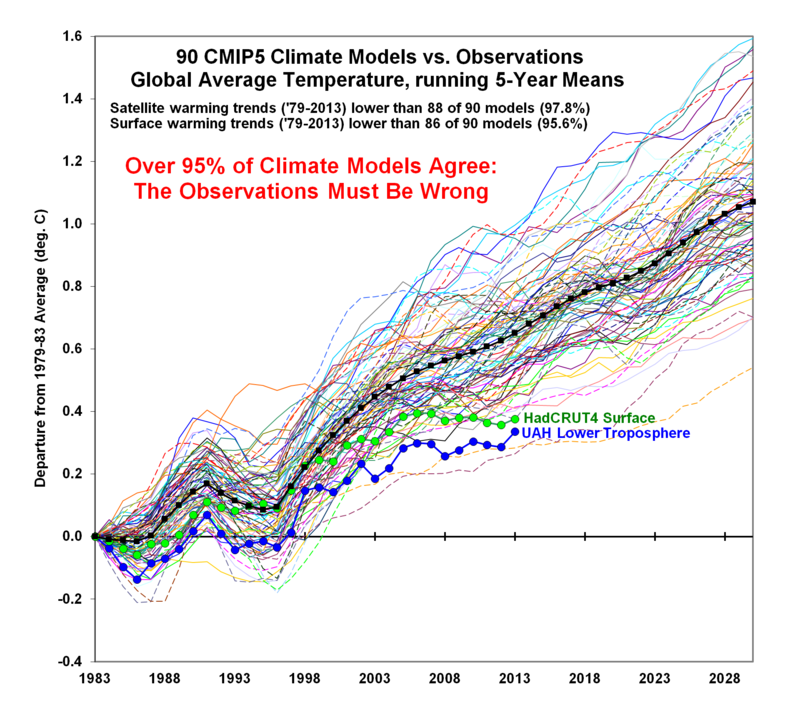 Responding to denier model comments is virtually guaranteed to bring up the inestimable Dr Roy Spencer's magnum opus - the work with which he chose to cast away every shred of professional respect he had ever earned - "90 CMIP5 Climate Models vs Observations"
1) Strong initial identification of Al Gore with the field. Having beaten their candidate in the popular election - a candidate who would become one of the worst presidents in US history - Al Gore has always been someone conservatives wish very much would simply disappear. 2) Support for business and industry has always been a wide plank in the RNC's foundation. Historically, there has been no larger business than oil and coal runs very close behind it. AGW's contention that such industries must be curtailed and replaced with new ones threatened close friends and generous, long-time supporters of the Republican Party. 3) Religion. AGW is the dark side of humanism. Conservative Christians strongly believe that God created this planet for the benefit and nurture of the human race. That human industry could make the planet fundamentally less hospitable is seen as a rejection of the divine providence and omnipotence. Mars has not experienced any warming concurrent or coincident with Earth's AGW. Like all the Solar System's planets, Mars has an elliptical orbit and moves closer and further away from the sun during the course of it's 1.8 year year. The planet also has a very thin atmosphere and no ocean and thus a possesses a tiny fraction of Earth's thermal inertia. That is, it will change temperature much faster and with far less forcing than would be the case on Earth. Observations of the other planet's in the Solar System fully support the reality of the greenhouse effect. No such observation throws the slightest doubt on AGW. understanding that correlation does not imply causation. Sure, there is a correlation between a rise in CO2 levels and a rise in surface temperatures. That doesn't necessarily mean that CO2 is causing warming. The board I came from featured a poster for whom this comment was a religious mantra. He seemed to think that temporal correlation was a complete refutation of any causative link. It is quite true that [A then B] does NOT prove that A causes B, but it IS evidence that such is the case. Fortunately (or unfortunately) the case for human GHG emissions being the primary cause of warming observed over the last 150 years is based on far, far more than simple correlation. That humans released the added CO2 in our atmosphere is calculable from simple bookkeeping. We can produce a very good estimate of the amount of coal and oil burned and any good high school chemistry student can tell us how much CO2 would be produced. We can make excellent estimates of how much will go into solution in the world's oceans and how much will be taken up by the world's photosynthetic flora. The result matches observations very closely. Taken from the other end, isotopic analysis of the Earth's atmosphere shows that 120 of its current 400 ppm CO2 came from the combustion of fossil fuel. That CO2 absorbs infrared radiation that would otherwise escape to space has been demonstrated and measured in labs thousands of times. The greenhouse effect is very fully understood and the warming expected to be produced by the gradual addition of 120 ppm is precisely what has been observed. Climate scientists are not depending on simple correlation when they say global warming is anthropogenic. It's just as likely that warming is causing more CO2 to precipitate out of the oceans. This seems to be backed up by the paleo record which shows that CO2 actually lags behind temperature. Well, you say, it may be small, then, but the Earth's oceans are releasing CO2. Not so fast, say I. There are TWO parameters that determine how much of any gas goes into solution in an exposed liquid: temperature and the partial pressure off the gas in question. The partial pressure of a gas is simply the total pressure of the gas mixture (our atmosphere in this case) multiplied by the proportion of the mixture made up by that gas. If we use 'atmospheres' as our unit, the 78% nitrogen, 780,000 ppm, found there has a partial pressure of 0.78 atmospheres. The 21% oxygen, at 210,000 ppm has a partial pressure of 0.21 atmospheres. Thus the partial pressure of CO2, having increased from 280 ppm to 400 ppm, has risen by almost 43%. So, solubility has decreased by 0.02166%. Partial pressure has increased by 43%. What do you think will be the result? The far too oft-repeated claim that CO2 can only follow temperature, not lead it is complete nonsense. Increasing temperatures DO cause CO2 to come out of solution and increase in the atmosphere. That does NOT indicate in any way that CO2 does not cause temperatures to increase. In fact, a 2011 study of the Holocene by Jeremy Shakun showed that in almost every case, warming initiated by Milankovitch orbital variations, was enhanced, accelerated and extended by greenhouse warming from the released CO2. I hope some of this helps. Thanks for giving me the opportunity to set the record straight on this variety of denier claims. Where I said: "So, solubility has decreased by 0.02166%. Partial pressure has increased by 43%. What do you think will be the result?" I should have said: "So, temperature has risen by 0.02166%. Partial pressure has increased by 43%. How do you think solubility will be affected?"